Once fixed, you can venture down the river and discover a new fishing area and meet Angus. Angus will guide you through the basics of fishing and receive 3 free lures. To check on your progress, check your uncle’s old fishing book to be rewarded for each new type of fish you catch. To start fishing just tap and hold a lure, and drag it into the water. To create new Lure, allowing you to catch new fish, you will need to use the Lure Workbench. Try to attract a fish to the bait by slowly moving it in the water. Once a fish bites, a circle will appear around the pool and start to close. You need to keep the struggling fish inside the circle by pulling the line in the opposite direction to where the fish is swimming. If you can keep the fish inside the circle until it closes, you have caught the fish and can collect your reward from the fishing scrapbook. You will NOT lose lure if the fish gets away. If you need any help whilst fishing tap on Angus and he will help you out. How to Unlock Fishing Areas? You will notice that some of the water will be covered with fog and in order to see it you have to unlock it. Unlocking fishing areas is just like unlocking expansion slots back at the farm. You will need a certain amount of land deeds, mallets and marker stakes to unlock any given area- the exact amount will display when you tap on a locked area. If you need expansion items to open an area you can be patient and wait until you find the missing items or you can purchase them with diamonds by clicking on the “+”. 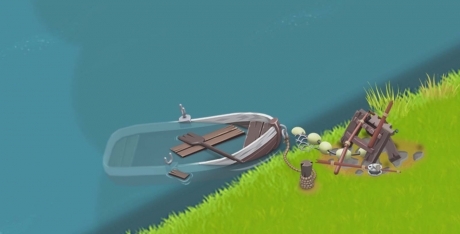 Using the latter option you will be able to immediately unlock a new fishing area. There are several different fishing areas to discover (rocky areas/deep areas/shallow areas/reef areas) different fish can be found in different fishing areas. Below you can find out more information about fishing in Hay Day.